Native musical instruments are used in Theyyatam festivals. The instruments are played in accordance with the steps of the dancer. 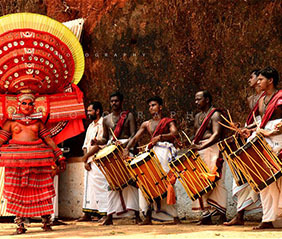 Drum, Kuzhal, Perumbara, Counch, Cherututi, Utukku and Chermangalam are well known musical instruments used in Theyyatam. The rhythm of the playing of these instruments varies from Theyyam to Theyyam. The continuous playing with measured interludes helps to make the performance very impressive. According to the rhythm of the instruments, the same instrumental players recite ‘Theyya Thotams’ also for the theyyam deity. The entire activity of a theyyam from the time the impersonator gets possessed till the time he castes off, is expressed in the form of singing and dancing by the same persons and companions. The rustic singing and agile and light body movements to the accompaniment of music make the performance fascinating. According to style, dance is classified as ‘Tandava’ or the masculine and ‘Lasya’ or the feminine. Both styles are adopted in Theyyam according to context and character of the deity. Inward, outward and circular movements with agile and light steps give these dances a more graceful style.